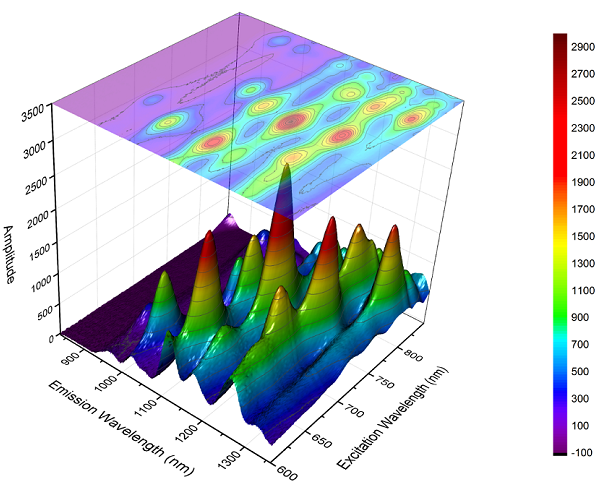 This graph displays a 3D Colormap Surface plot created from a matrix-like block of cells in a worksheet. The corresponding X and Y spacing of for the block of data are uneven, but Origin allows such data to be plotted as a surface or contour plot using the Virtual Matrix feature. Additionally, the data has been projected onto the XY plane as a contour plot using the same color mapping as the surface. The projection has been set to have transparency so that the 3D surface is visible through the projected plane.